Check domain name available or not in Twitter! On what way you check domain name available or not? usually all peoples go to some domain registration company like Godaddy, Namecheap etc and check if the domain is available or not. But today I will show you different and interesting method of checking domain name available or not in twitter!. We all know about Godaddy one of the famous domain registration company and one of the most trusted company online to register domain names. Of course, they are also providing hosting service but it is not so popular as compared to domain registration. Godaddy is not only providing domain name search option in their website but they are also offering domain availability checking through twitter!. Yes, Godaddy domain registering company offer peoples to check domain availability through twitter. Most of the people are not aware of this Godaddy service which is available in twitter. In Godaddy twitter domain name check facility you are not able to check bulk domain names , you are only allowed to check one domain at a time. How to use Godaddy Domain name check in Twitter? It’s so simple to use, the only thing you need to do is follow them @domaincheck and send a direct message (they will follow back within 24 hrs) to them containing a domain name with extension to check domain name available for registration or not. After sending DM (Direct Message) to @domaincheck they will DM you within 5 min whether that domain name available or not. It’s really easy to use. You can search for one domain at a time. Do not include “www.” For example, enter d domaincheck Ashout.com, where “Ashout” is the domain name and “com” is the extension. Does not contain invalid characters – Only letters, numbers, or hyphens are allowed. In the below image I’m sending DM to @domaincheck to see exampleDomain.com is available or not. 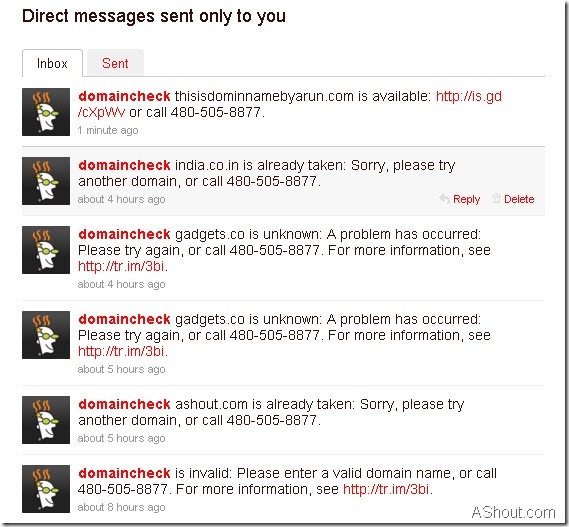 After sending DM to @domaincheck you will get one of these replies. “Domain name” is available: “link to register domain” or call 480-505-8877. “Domain name” is already taken: Sorry, please try another domain, or call 480-505-8877. “Domain name” is invalid: please enter a valid domain name, or call 480-505-8877. A problem has occurred: Please try again, or call 480-505-8877. For more information, see Working with Go Daddy Domain Check for Twitter. .
See the below image, they sent some error message through DM if the domain name already registered or for other purpose. How we can benefit using twitter to check domain name availability? It completely depends on you. For an instance, I’m on twitter and I got one creative domain name and I need to check whether that domain name available or not. Instead of leaving twitter or for time-consuming purpose (searching domain registration company, loading that website etc) you can check whether your desired domain name available or not by sending a tweet. Isn’t great? If are interested, give it a try by following @domaincheck and send DM to them.It won’t cost anything, it’s free service by Godaddy. Hope you enjoy this post, If know any other creative service like @domaincheck on twitter share those in comments. Are you think, it can benefit you by using @domaincheck service in twitter? i hv never tried such trick in twitter before ….. I really enjoyed it, this service is veRy uncommon. And they posted just 4 tweets, thanks for sharing.